Joscar Smash Repairs and Restorations was founded in 1983 and the father and son team, Joe and Brian D`alfonso, share a passion for classic cars, Tri-Five Chevrolets in particular. The moniker for the business was conjured up from the amalgamation of the names of Joe and his wife Carmen. With over sixty years experience between them Joe and Brian possess the required skills to perform top quality panel and paint restorations. 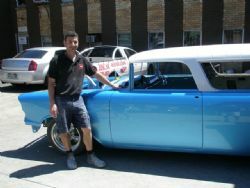 One of the best forms of advertising is having a car that showcases your skill set and Joe has a pristine fully restored 57 Bel Air convertible that is well known on the show circuit in Sydney and is street driven. Anyone that has visited Motorex in the past two years would have seen his car and since it has been built it has collected more than its fair share of trophies. 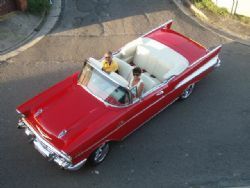 The sleek red convertible gets regular runs on club events and has been up to Kurri Kurri numerous times for their annual show. It is not surprising that most of their business is word of mouth or derived from admirers who have seen Joes and other customer cars. Brian currently has a 55 Bel Air convertible under construction which when finished may result in some inter family rivalry. 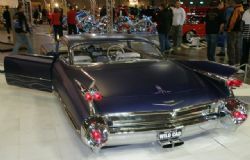 In 2009 at Motorex the first car you came across in the main hall was a slammed and chopped 1959 Cadillac called Koolsville. The sheer size of the car commanded your attention and the custom bodywork had many spectators guessing exactly what had been smoothed, shaved and tweaked. The car was not complete, more a work in progress. That progress is continuing at Joscar and the caddy is currently seeing Joe and Brian finish off the internal sheet metal, undercarriage, trunk and engine bay for paint. Once Joscar has painted those areas, the owner is bringing Gene Winfield over from the USA to paint the exterior of the car and it will likely be on the show circuit for some time. The workshop has all the necessary equipment to produce arrow straight bodywork and show quality paint jobs. Currently in the shop is the aforementioned Cadillac, two Tri-Five Chevrolets and an XY GT replica. Services cover rust repairs, fitting and aligning replacement panels, fabrication and modifications, right hand drive conversions, smoothed firewalls and panels and a paintwork polishing service to rejuvenate your cars finish. They will also project manage an entire turnkey project for Tri-Five and Mustang owners. Over the years they have met many classic car enthusiasts and their passion extends to the supply of spare parts for Tri-Five Chevrolets that encompasses panels, moulds, rust repair sections, some steering components and dashboards. They also buy and sell complete Tri-Five Chevrolets and Mustangs and through their many connections have assisted customers to find the right project or completed car for them. I currently have entrusted my own 57 Chev Nomad to Brian and Joe to perform the panel and paint aspects of the restoration and under the Articles tab on the Classic Cars Gurus website are a swag of stories documenting this process. This has given me an insight into how they work and their level of professionalism. Needless to say I would not hesitate to recommend them as their communication, knowledge and experience would be difficult to match. Aside from an outstanding job there have been many occasions when they have offered advice on numerous aspects of the restoration that has produced a better outcome, a cleaner look and saved me money. 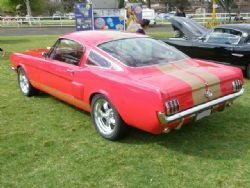 Lately there have been a number of Ford Mustangs in the workshop which resulted from club members viewing one of the cars they restored and liking the end result that much that they chose to have Joscar perform their restoration for them. There have been numerous Porsches, a Dino Ferrari, an MGA, a 1959 Cadillac Eldorado Biarritz, Fiat 600 and other classics through the workshop so their skills are not limited to Chevs and Mustangs. If you share their passion for classic cars and are looking for a professional body shop to provide a wide ranges of services for your classic car then give them a call on (02) 9772 4923. The workshop is open Monday through Friday from 7.30 to 5.30 and Joe and Brian will be happy to discuss your requirements.